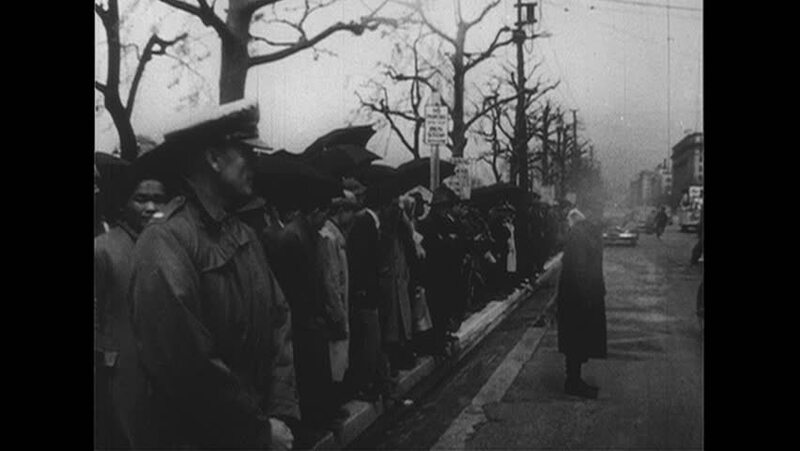 UNITED STATES 1950s: Crowd on sidewalk in Tokyo / Car pulls up to camera / Douglas MacArthur exits car / MacArthur walks past crowd into building. hd01:17CIRCA 1910s - The American Unknown Soldier from World War One is paraded through Washington D.C.
hd01:19CIRCA 1950s - In March 1951, the 24th Infantry Division fire on the Red Army in the hills of the Yangpyeong area, South Korea, and take Chinese prisoners of war. hd00:37CIRCA 1918 - British officers observe the bombardment of a German blockhouse. hd00:34CIRCA 1910s - Military officer candidates ride horses pulling cannons, and shoot cannons during training at Camp Zachary Taylor in Kentucky. hd01:41CIRCA 1950s - Aggressor forces fight against the enemy in simulated battle conditions in the 1950s. hd00:57CIRCA 1950s - On the front lines, soldiers at the observer post try to find the enemy's location, the coordinates are retrieved and bombs are then fired in the 1950s. sd00:46CIRCA 1953 Black flags are flown, and Russians read and buy newspapers on the streets after the death of Stalin.